"My mission is to help those I work with become successful. This is not just a mission statement. I make it actionable." You would expect any professional to bring a certain amount of expertise to the table. 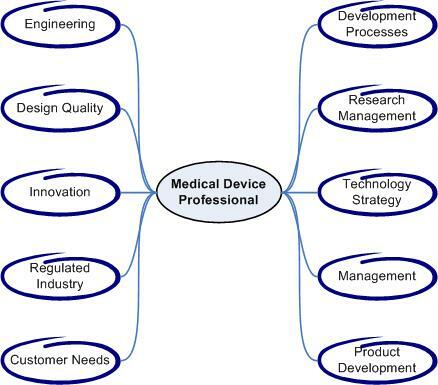 I have identified 10 key dimensions that must be in a Medical Device Professional's portfolio. Skills and experience in each dimension make the difference between success and failure. Getting in front of your design project and establishing the right scope to meet your customer's needs is more than a guessing game. Here, I talk about how you can get your customers to define your product and how you can provide the right solution to meet their needs. Managing your Intellectual Property (IP) is as important as managing your bank account. It's important to have an IP strategy and to follow it. On my IP page ,I discuss some of the things that a good business manager needs to do so that resources are used most effectively. I've had a great career challenging the status quo. I believe in building teams with people that can collectively think outside the norm and individually complement each other with their unique strengths. To find out more about how I can help your team, contact me directly. Copyright © 2009, 2010, 2011 CW Riley. All Rights Reserved.